H.G. Mor Julius Yacoub was born on 27 December 1912 at Pampady, Kottayam. 'Yacoub' (Kunjappan), as he was known in his younger days, was the son of Madappatt Chacko and Annamma. His parents died when he was a child and his elder brother took care of him. His primary education was at Pampady and Vazhoor. He had to discontinue his high school education while at N.S.S. High School, Karukachal due to ill health. Yacoub persued his theological studies at Sharbil Dayara, Thrikkothamangalam. The very Rev. Kochuparambil Geevarghese Ramban and Vanchithattil Kuriakose Ramban were his teachers at the Dayara. Mor Michael Dionysius was also staying there at that time. One of his collegues was Parayakulath Yacoub (later His Grace Mor Themotheos Yacoub). 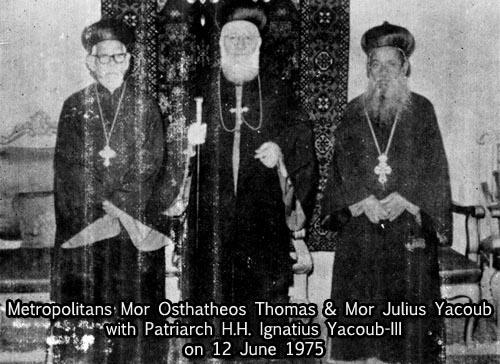 On 24 May 1942 Yacoub was ordained Deacon by Mor Dionysius Michael at St. Mary’s Church, Manarcad. 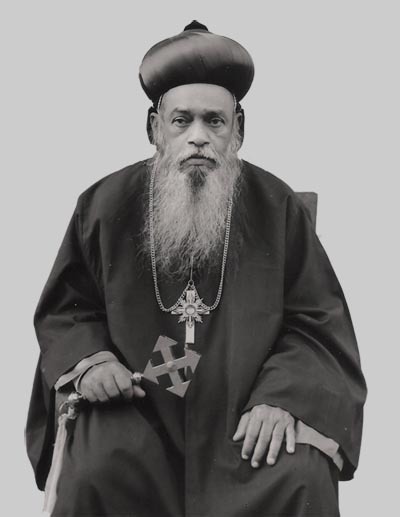 On 19 August 1945 Deacon Yacoub was ordained Priest by Mor Dionysius Michael at St. Thomas church, Chengalam, Kottayam. A little later, Rev. Fr. Yacoub joined Manjinikkara Dayara. On 19 June 1955, Mor Julius Elias, Delegate of the Holy See of Antioch, ordained him Ramban. Ramban Madappattu Yacoub taught Syriac and liturgy to several students at Manjinikkara and at Malelcruz Dayara during 1962-64. 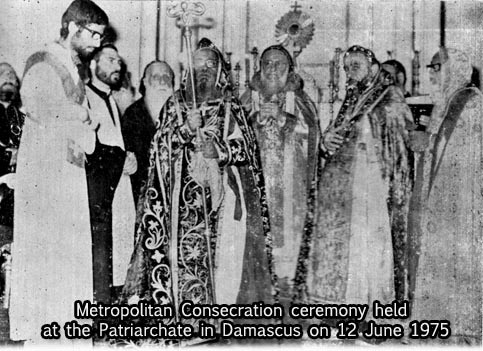 On 12 June 1975, Ramban M. C. Yacoub was ordained Metropolitan by Moran Yacoub III, the Patriarch, at St. George Cathedral, Damascus by the name Julius. His Grace was appointed to oversee the Simhasana churches and institutions that are directly under the Holy See of Antioch. In November 1990, H. H. Patriarch Zakka-I Iwas honoured him with the title ‘M’Shablono Thobo’ meaning the spiritual teacher. His Grace Mor Julius Yacoub served the Holy tomb of Saint Elias-III for about half-a-century. His Grace was the President of the Evangelical Association of the East during 1963-64. H. G. served Mor Julius Elias, the delegate, as the secretary and translator. His Grace has translated a few books from Syriac. Those, include the book titled ‘Dove’ written by Bar Hebraeus, the Biography of Mor Yuhanon M’rahmono, The history of Mor Augen, the text of the sacrament of Holy matrimony which is in use in Syria, and a few prayers and promeon- sedro. His Grace was very particular about prayer and fasting. His life, food and dress were all very simple. His Grace used to correct the mistakes of the clergy of all ranks for his training was by Mor Julius Elias and Mor Dionysius Michael who never compromised with the respect for the traditions and practices of the Church. His Grace was getting ready for his departure and he prepared a place of rest for himself well in advance His Grace converted his ancestral property into a trust and a church was constructed on that land. On 21 January 1992 His Grace was admitted to hospital and on 24 January 1992 His Grace breathed his last. The mortal remains were interred at Manjinikkara on January 25. The memory of Mor Julius Yacoub is celebrated on January 24. The author of this biography was ordained korooyo by His Grace in 1976.